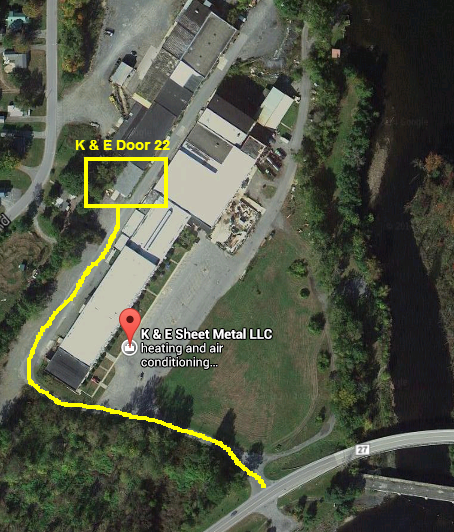 The K & E Sheet Metal fabrication shop is located at 22 Hudson Falls Road in South Glens Falls, New York, inside the Epic Holdings Building, Door# 26. Once you turn into the main entrance for the building, going past the marquee sign (on your right) of businesses located inside the Epic Building, drive up the hill and take a right. We are the first building on the left after you pass Ariels Gymnastics and Chase Sports. Look for #26 hanging off the side of the building on the left. Use the picture added below for reference and use the map below to help you find the best route to our fabrication shop. You can also find more information for our location and directions on our Google Places page. See ya soon!